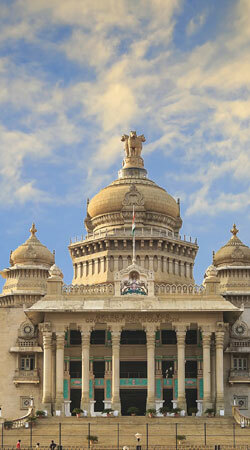 Few places leave a mark on our memories such as this stunning South Indian state of Karnataka. This land of Dravidians is a confluence of art, culture, nature and architecture.Defined by awe inspiring hills, ancient temples, laid back beaches, royal palaces and sprawling coffee plantations Karnataka is no less than a travel fiesta for the travellers. While the bustling IT hubs of Bangalore keep up its progressive, modern outlook, its rich past is reflected through its ancient temples and heritage sites spread all over the state. To every visitor the city of Mysore speaks through its palatial buildings and lively bazaars which unfold the story of its regal past. 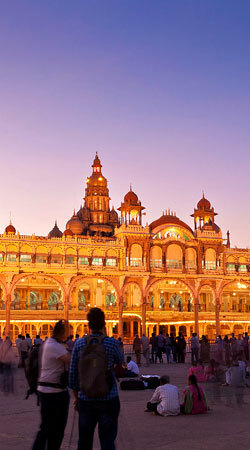 Start with the grand Mysore Palace, one of the most opulent palaces in India. Stroll through the palace interiors to treat your eyes with its lavish decor comprising of vibrant paintings, artistically carved wooden doors and an impressive collection of sculptures and royal armoury. Apart from the palace, make your way to explore the centuries old Devaraja Market famous for Mysore silk and exquisite spices. Enjoy a panoramic view of the city of Mysore, standing atop a 1062 m high Chamundi hill and visit the Sri Chamundeswari Temple at its summit. The so called “City of Ruins”, a UNESCO World Heritage Site. 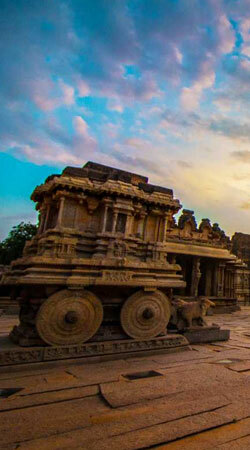 Travel back in time of the mighty Kings and majestic architecture at Hampi. Once the richest kingdom in the world under the VIjayanagara Kings, it still poses its old glory in the cluster of ruins lying amidst its rocky terrain. Every temples and palaces of Hampi stand witness to the mighty Vijayanagara rule and each has a different tale to tell altogether. The Virupaksha Temple, the Vittala Temple and the Hampi Bazaar are the prime attractions of this ancient city. 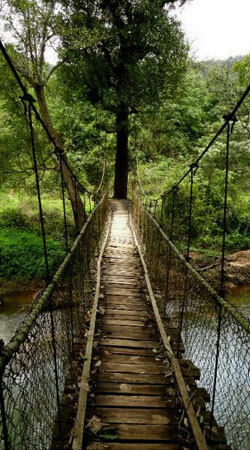 If lush green mountains and hot cup of fresh brew coffee are your thing, watch out for the tranquil hills of Coorg. Long stretch of Coffee plantations, misty mountains and the cool, serene atmosphere make it a fabulous spot for a great holiday. Trekking and bird watching are some of the most recommended activities here. The high altitude peaks of Pushpagiri & Tadiyendammol are always welcoming to entertain travellers in its wilderness. Head to the nearby Abbey falls if you do not mind getting wet. Amble along the peaceful Namdroling monastery and the Tibetan markets spread along 1000 hectares of sugarcane fields. The serene seaside clubbed with rocky terrain makes Gokarna an ultimate beach destination. It has grabbed attention from International travellers looking for a quiet sunbath or a hedonistic Ayurvedic massage. Indulge yourselves in water sports or practise Yoga postures on the beaches of Gokarna. 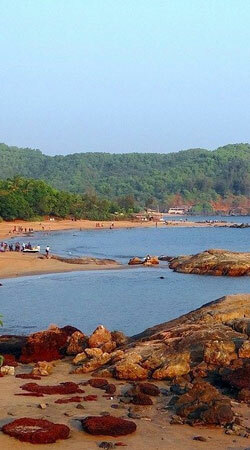 Unlike the party atmosphere in Goa, Gokarna offers a completely tranquil ambiance. The Om Beach, the Paradise Beach and the Kuddle Beach are the ones to look out for. 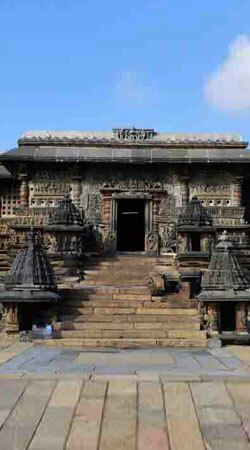 The Channakeshava Temple and the Hoysaleswara Temple at Belur and Halebid are the finest exemplars of the royal Hoysala architecture. Gaze in wonder at the intricate carvings skilfully worked out by the ancient artisans. They stand testimony to the most artistically gifted period in the South Indian history. 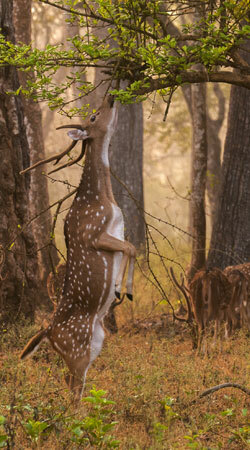 Enjoy the beauty of Nilgiri Biosphere, the gleaming Kabini river and tigers moving around, a lifetime experience ! Packed with adventure, a jeep safari through the Nagarhole National park expose you to some spine chilling sights of the wild. Witness tigers, elephants, deers, and other wild residents of the jungle in their natural habitat. Get mesmerised with the beauty of Gardens in the Silicon Valley of South India! Your gateway to Karnataka, the metro city of Bangalore is often referred as the “Silicon Valley of India” owing the name to its ever increasing growth in the IT sector. The Tipu Sultan Palace, the Vidhan Soudha, Lal Bagh and the Bannerghatta National Park are major attractions in its list. It also boasts of the World’s largest ISKCON temple, the Radhe Krishnachandra Temple. The 6th century rock cut caves and temples await you with bundles of stories told and retold! 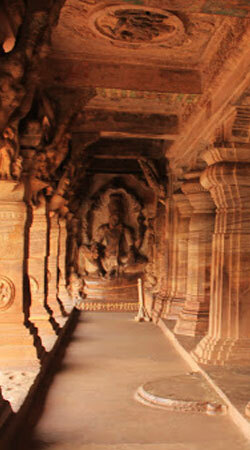 Once the celebrated capital of the Mighty Chalukya Kings, Badami is yet another treat for the history fanatics. The Chalukyan rule during the period of 6th to 8th century AD saw some of the finest architectural marvels of the country. They left their architectural legacy in the form of various magnificent temples and the most notable ones are the rock-cut cave temples at Badami.